Granuja Falls, originally uploaded by dmzajac2004-. Copyright Â© 2013 Deborah M Zajac. All Rights Reserved. 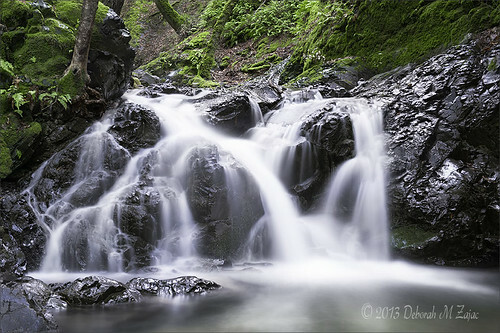 My mind turned to photographing waterfalls when we had several days of rain in Silicon Valley. I knew the falls around the Bay Area would be running full. The day was supposed to be partly sunny/cloudy, and not too cool. Since it was a week-day there probably wouldn’t be too many others around. I hadn’t been shooting long or got very far up the trail when it started to sprinkle. I hadn’t packed my rain sleeve so it was time to head back. Before reaching the parking lot the cloud overhead opened up and just poured! I’ll have to get back soon.